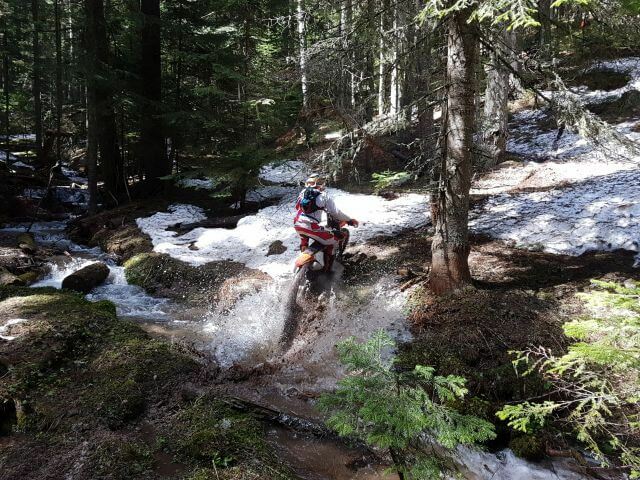 Test from Enduro Austria : Enduro Tours with EnduroMax Bulgaria! The communication with the provider has been excellent from the very beginning. E-mails were answered quickly and Maxim, the team leader, was very eager to respond to all requests. The correspondence was in English, and Bulgarians generally speak English quite well. 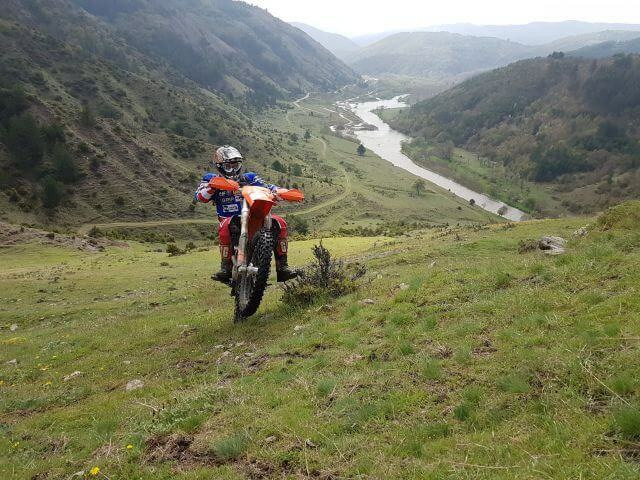 Enduromax Bulgaria offers two different tours on its website. Firstly, a ‘Tour Intensive’, which lasts for three days including the arrival and the departure day. The second one is the ‘Tour Pentadrom’, which lasts for eight days. The tours are described in greater detail on the easy-to-use website of the organizer. It is also available in German. 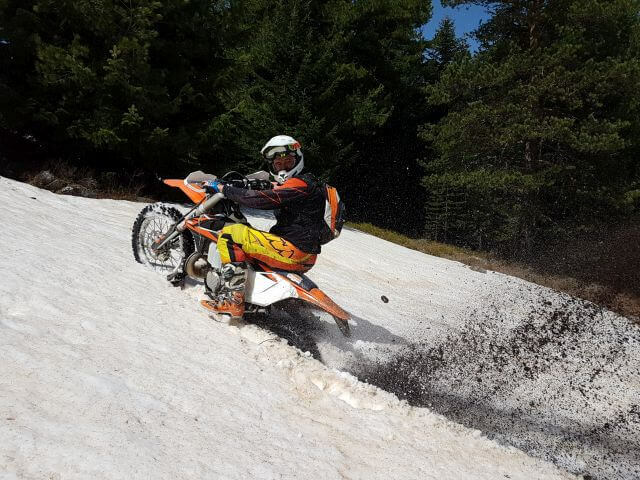 No doubt, other tours can be planned with Enduromax Bulgaria as well. Simply contact us and let us know of your wishes. Meanwhile, we tested a shorter tour, consisted of 3 days’ riding. The price of this tour is a total of 820 Euro – including rented motorcycles. Cost of motorbike rental: 380 Euro. Those who arrive on their own one, pay 440 Euro, – for the tour and the accommodation. We booked a return flight from Vienna to Sofia for 230 Euro – including 23kg of luggage. In general, this is just enough for the MX-clothes (which you could get from EnduroMax at sight, riding kit is included in Tour price) and a few personal belongings. The flights are available for an early booking as well, which means they’ll be under 200 Euro. 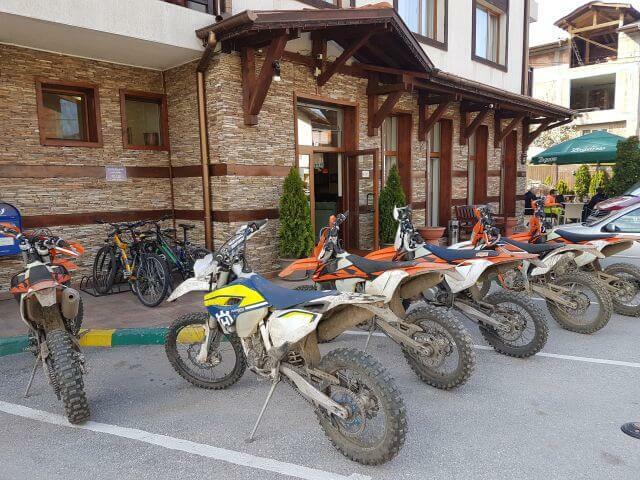 Enduromax Bulgaria welcomed us directly at the airport and transferred us to Banya. Most of the road is a highway, followed by a mountain road leading to the higher location of the village of Banya. Incidentally, this is only a few kilometres away from the famous World Cup ski resort of Bansko. The ski area was open until April 15 and if you had a booking for March, you could even combine the Enduro trip with a day of skiing. Ski rental equipment is available there just like in Austria and the day ticket for the ski area costs less than 30 Euro. 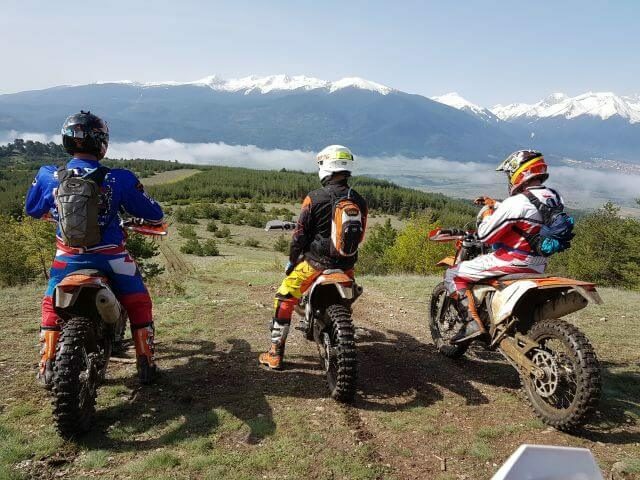 You do not have to worry about the temperatures for Enduro sport: over the closest mountain ridge of Bansko the temperatures are around +8 C which are optimal for Enduro riding. According to the organizers, this is due to the close proximity to the sea. 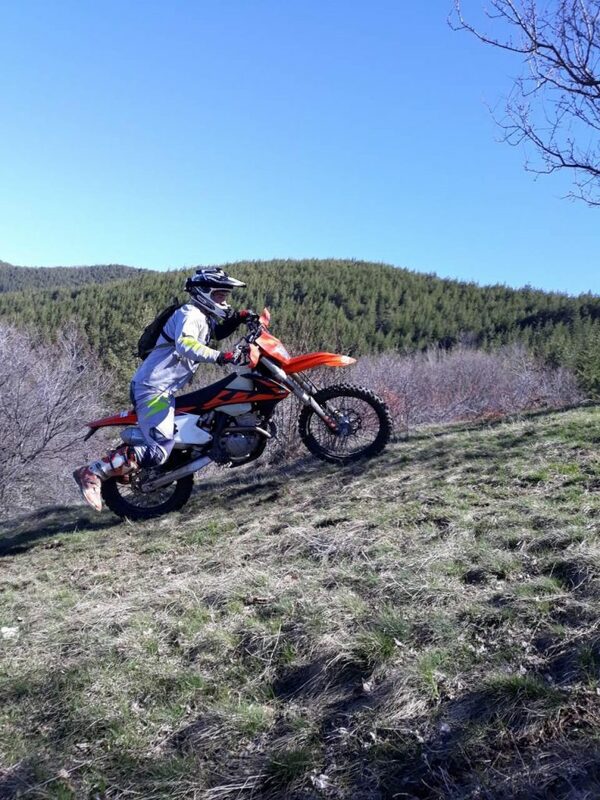 And while we are there: A combination with a beach holiday in Greece and Enduro in Banya would be possible, because the Greek coast is only within a 2.5 hours’ drive away. With the Thessaloniki airport nearby, a lot is possible there as well. But back to the tour: As soon as we arrived at the hotel, we looked at the vehicles. 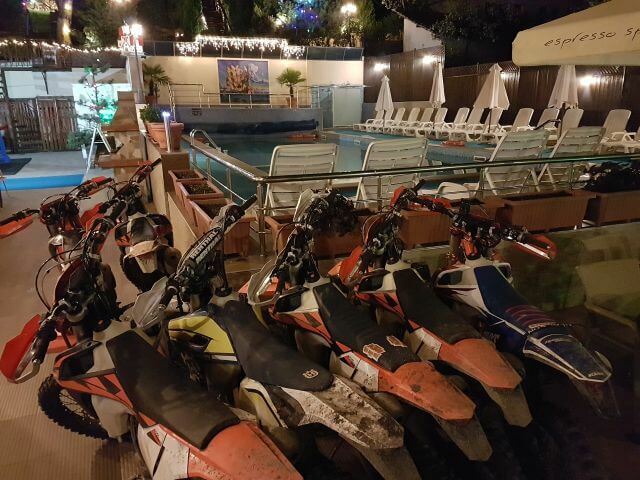 The organizer really invested a lot and has a whole fleet of new KTM 350 EXC-F 2018 models available. Even a 350 Husqvarna is there and whoever needs even more powerful vehicle can take a 500 series model. 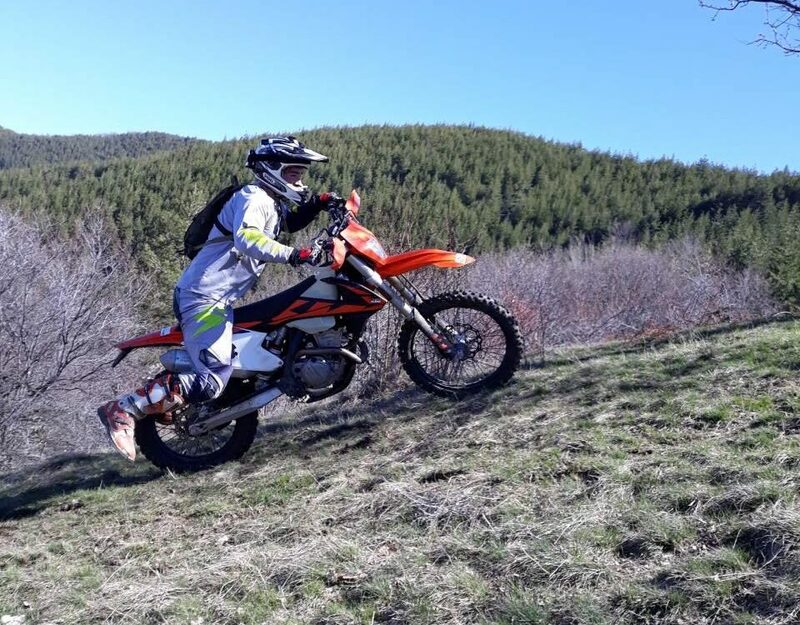 In addition, Enduromax Bulgaria has also purchased a KTM free- ride to allow even shorter athletes to partake in the Endurosport. The bikes are adjusted to their drivers and settings such as handlebar elevation and such are no problem either. The mounted tires were 90% suitable for the prevailing dry weather conditions. In case of rain, however, they would need to be improved quickly. The hotel itself is also owned by the tour operator. It’s a SPA hotel, which is also used by those visitors who love hot mineral water treatments. In Banya there are over 70 hot mineral water springs, with water temperatures of over 50 degrees and several thermal baths. 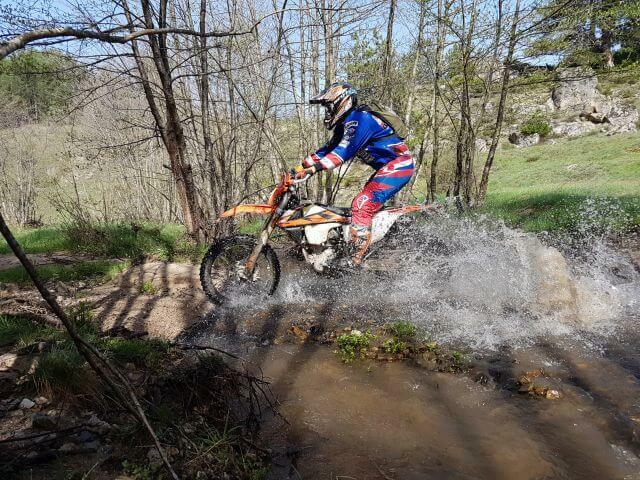 The hotel has two pools with water temperatures of 32 and 36 degrees, which is ideal to relax your muscles after the Enduro tour. Even an experienced masseuse/ massage therapist, who also works with professional skiers, is available. A 10 Euro back massage is the perfect end for the Enduro day. The hotel rooms are, in fact, small apartments which are well maintained and are in accordance with the well-known south-eastern standards. The crew and the hotel staff are very friendly and hard-working. In our case, we spent the first day of the tour with the boss/team leader, himself. The division was made on site after a short check of our riding skills. 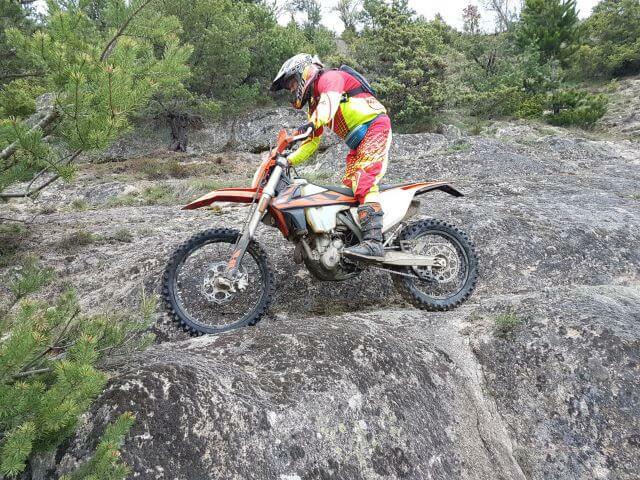 Thus formed, there was a group of 4 including the boss, 2 Enduro-Austria riders and a good rider from Sweden. To help us acclimatise to our new surroundings, the team leader, also acting as tour guide, Maxim showed us the whole area around Banya. The terrain is actually comparable to that of Austria – maybe a bit more spacious and with more broad-leaf rather than coniferous forests. 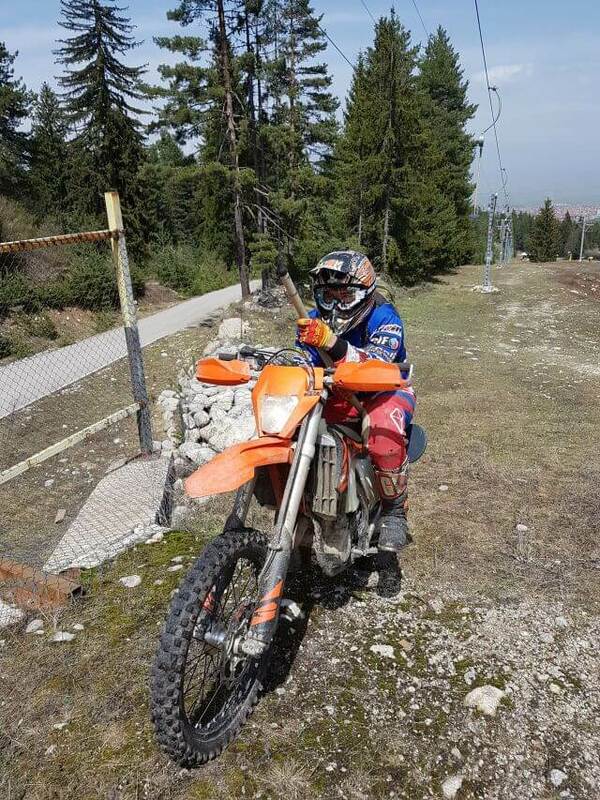 There are countless eroded mountain roads and one can ride on the mountain slopes there as they like. There are also many places with long driveways of all variations that can be approached again and again. These “playgrounds” offer the opportunity for participants to go crazy while those who still have not had enough can let off some steam. You can really go anywhere in this area without encountering any problems. But for those who are already thinking of riding there yourselves, we urgently need to advise you against it. There is a crucial reason why one should not do this: the shepherd dogs. They are special dogs, bred and trained to protect their herd. And we are not talking about the little Border Collie shepherd dog but about a breed of dog that is more like a calf in terms of size. Well-trained dogs that even take on wolves, so either you need to know them or rely on the guide who skilfully avoids them. So do not worry, the guide is all in the green area 🙂 So day one was a brisk Enduro excursion with a few hearty driveways. Of course, the group can always decide for itself how hard it should be further during the tour. At lunchtime we would return to the restaurants. The Bulgarian cuisine is very good at presenting us with the right eating atmosphere and the prices are very low, being almost half of the Austrian prices. On day 3, we once again visited the deep forests of the area and dealt with some forest driveways. 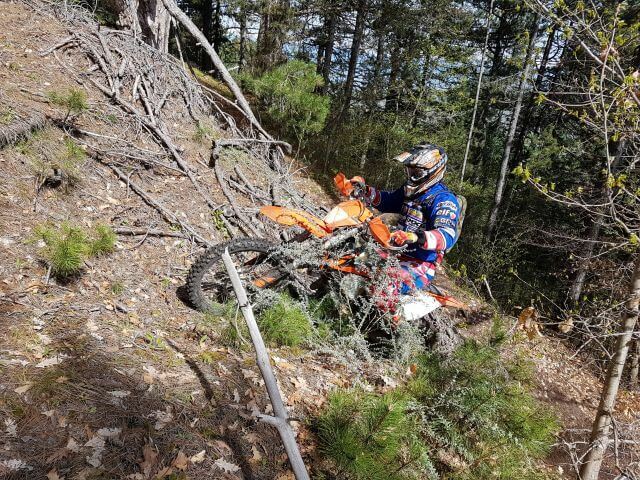 Enduromax Bulgaria is now going a step further and is already building its own Enduro Lounge right on the edge of the forest. Currently, one still rides from the hotel and straight into the woods. Although these are only a few hundred meters, in the future there will be a building, constructed precisely by the forest, which will be equipped with a motorcycle garage, chill-out area and more. 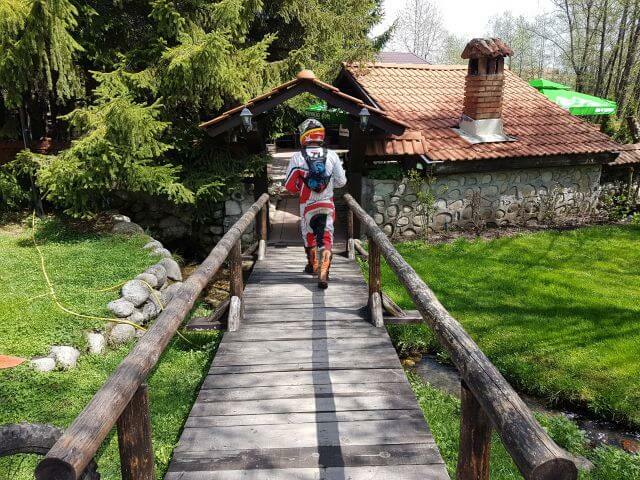 What’s more, it will be just for the Enduro riders. The building should be ready in the autumn.